Highly respected Dallas Felony lawyer with 22+ yrs experience. Aggressive, skilled attorney for defense of Felony criminal charges. 10/10 AVVO rating. Free consultation. 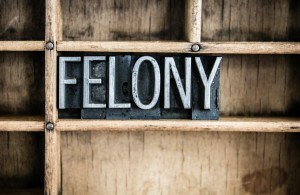 Felony Offenses are the most serious types of cases in the criminal justice system. Even the lowest level felony case can result in at least 180 days in a State Jail facility without the possibility of early release. The most serious cases can result in a LIFE sentence in prison without the possibility of parole or even the death penalty. Roger E. Haynes has the experience and resources to fight even the most serious felony cases. Your future and freedom can depend on retaining a Dallas criminal defense attorney as soon as possible. Call Roger E. Haynes for a free consultation. Below is a list of commonly charged Felony cases. If what you are charged with is not on the list, please call. We can discuss with you whether the case is uncommon or may not be a felony level offense. Free Consultation – Speak with Dallas felony lawyer Roger Haynes personally and confidentially about the defense of your criminal charges today. Call him now at (214) 526-3300. • Assault Bodily Injury Family Member/Enh. Call Dallas Felony criminal lawyer Roger E. Haynes for a personal, confidential, free consultation today at (214) 526-3300. If you scanned through the list of crimes above and found what you were charged with listed there then unfortunately you have been charged with a felony. In Texas a felony conviction can carry long-term and very serious consequences in addition to whatever the punishment might be for that crime. For example you’ll lose your right to vote if you are convicted of felony. You can never again express your opinion about the direction the country should be going by voting for the candidate of your choice. You just be along for the ride while the rest of us decide these things for you. Also, under federal law, you will never be able to legally own a firearm. Think about this . . . if you are an avid hunter or enjoy occasionally going hunting or hope to one day teach your kids to enjoy the outdoors hunting, you will never be able to do that again. Here at the Law Offices of Roger E. Haynes we want to help you avoid that conviction on your record. We have over 22+ years of experience handling felony cases. It would be a privilege for us to serve you and your family by representing you in court. Our goal is to assist each and every client as an individual. No two cases are ever exactly the same. We do this by listening to your side of the story, addressing your concerns, providing answers to your questions, investigating and fighting the charges against you, discussing the options available for defenses, and ultimately making sure that you understand your rights in the criminal justice system before you make a decision of how you want to handle your case. There are three main paths the resolution of a criminal case. The first and most widely recognized path is to plead “not guilty” and go to trial. In this scenario the State has the burden of proving the defendant’s guilt beyond a reasonable doubt and a judge or jury would decide whether the defendant is guilty and what the punishment should be if the person is found guilty. The opposite end of the spectrum would be to work out a plea agreement with the State that, in exchange for the accused citizen’s plea of guilty, an agreed-upon punishment would result. The final option is what is often called an open plea or a slow plea wherein the accused citizen agrees to plead guilty to the charge but does not agree with the State’s recommendation for punishment and requests that a judge or jury set punishment. If you decide that you want to fight your case and go to trial we are fully equipped and capable of preparing your best defense, presenting your side of story to the jury, and giving you the best chance of success in beating the case. If you decide to enter a plea of guilty, we will do all in our power to work out the most fair and reasonable punishment based on all the unique circumstances of your life, taking into consideration the facts of the case and any prior criminal record. If the State simply won’t be reasonable, we will help you decide whether an open plea is in your best interest considering all of the above factors and which court your case is assigned to. Sometimes who your judge is can make a difference. Our knowledge and experience with Dallas courts and judges is vital in helping you make these judgment calls. Call (214) 526-3300 today and let us help you fight your felony charges and counsel you through the process. Free consultation. Thank you so much for representing me. I just want you to know how happy I am for your work on my case. Again, thank you so, so much!!!!! Mr. Haynes truly cares. He kept my family and I informed all the way through my case, even when I was in jail. He knew my Judge and worked to give us ample time to prepare for my trial. And when that day finally arrived, he was well prepared and coordinated everything perfectly. He was part of God's plan for my priceless freedom and changed life, to this very day. He is not only a good lawyer, but a good man. What Will Happen to Dallas Police Officer Who Killed Man in Own Home? What’s The Most Common Question a Defense Attorney Answers? What Should You Do If You are the Victim and Want to Drop Criminal Charges? Dallas, Collin, Tarrant, Denton, Ellis, Kaufman, Grayson, Hunt, Rockwall, Johnson, Navarro, Parker, Wise.